The Standing Lincoln sculpture (aka – Lincoln: The Man) is considered the most important sculpture of Abraham Lincoln from the nineteenth century. The 12-foot bronze figure standing before his Chair of State was designed on commission by Irish sculptor Augustus Saint-Gaudens (1848-1907) who became one of the foremost sculptors of his time. The sculpture is mounted on a semicircular exedra designed by architect Stanford White. 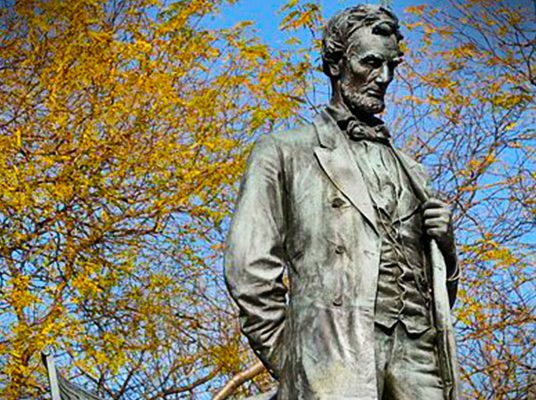 Chicago lumber merchant Eli Bates (1806-1881) designated funds in his will to create the statue, which was to be located in Mr. Lincoln’s namesake Lincoln Park. The statue was dedicated on October 22, 1887. Present at the dedication were a trustee of the Eli Bates estate, Abraham Lincoln II, the president’s grandson, and a crowd of 10,000 people. Revisiting a past project from 1989, we plan to refurbish the once award-winning garden beds that grace the parkway leading to the Standing Lincoln statue. Cleaning of the monument is also planned. 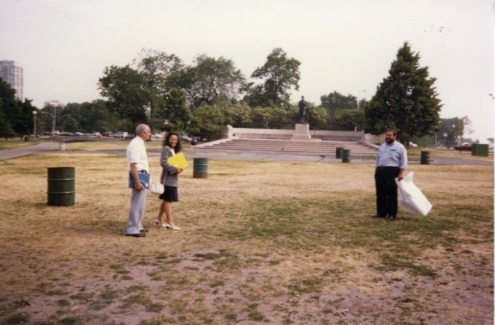 In 1989 we restored the “Standing Lincoln” monument including its granite exedra and plaza with the Chicago Park District. 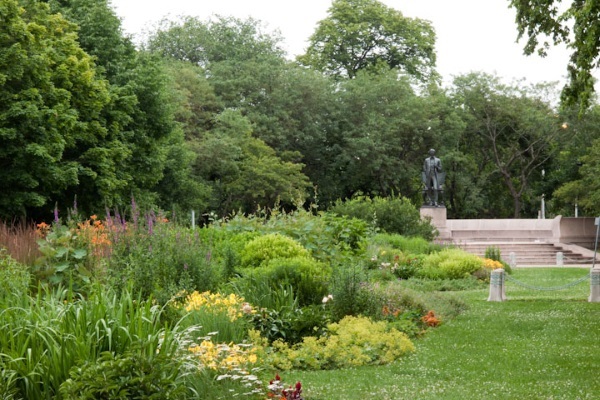 Since the monument’s placement in the park did not fit this illustrious piece of public art, we added a formal garden to draw people to the monument. In 2018, we added 12 new replacement benches to the garden and monument area. To adopt one of these benches, please visit visit our adoption page. The 8,200 s.f. Renaissance-style garden consisting of six geometric planting beds was added in 1989. To frame the garden, paved stone sidewalks and an allee of trees and benches were added. To match the park’s historic character, ornamental lighting and bollards were the finishing touch.